Planning a wedding can be an exciting time but with so much to organise we understand it can also be stressful. We can assist you with planning your wedding marquee every step of the way, to make the process as smooth and enjoyable as possible. 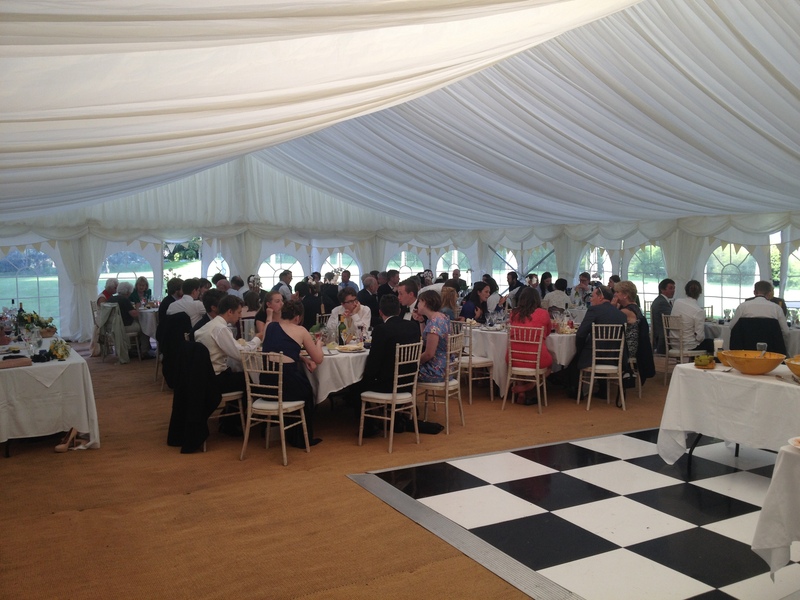 Our wedding marquees can be customised and personalised to suit your colour scheme and requirements. You can choose from a range of flooring, lighting, furniture and other additional features to give you and your guests a completely unique setting in which to create special memories of the big day. 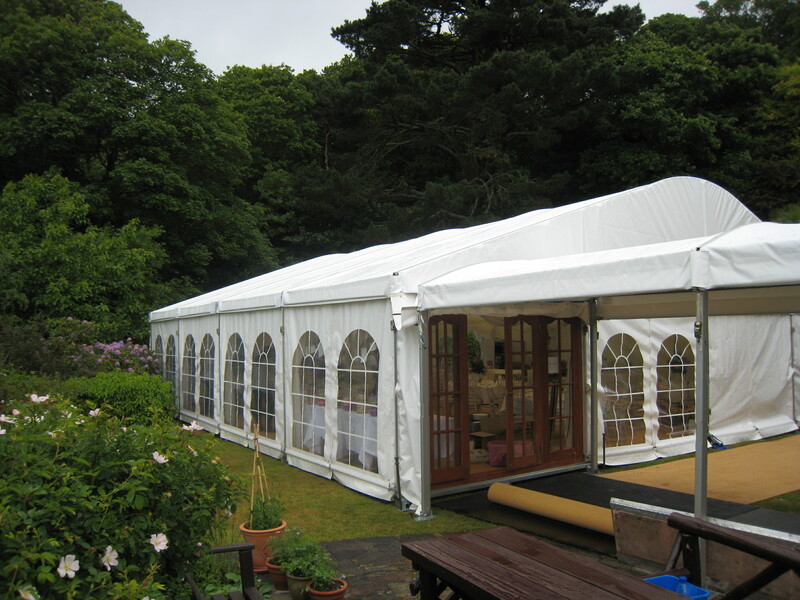 As the frame of the wedding marquee provides the marquee’s support this means there are no unsightly or awkward poles to obstruct your guests’ view of the day’s proceedings. Our marquee linings are bright and contemporary, bringing a touch of luxury and opulence to the occasion and cover up the frame to fully finish off the look. Wedding marquees can be fitted with window walls allowing guests to enjoy the views of your chosen setting from the day through to the evening reception. If required, walls can even be completely drawn back for an al fresco feel. 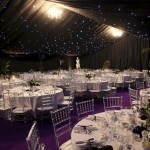 Marquee heaters can also be supplied providing comfort to guests at winter weddings or on those chilly summer evenings. If you want us to arrange any elements such as additional drapping, bespoke flooring or lighting we can take the hassle away for you and source options and co-ordinate with our trusted local suppliers, giving you peace of mind that all elements are being covered and you have one point of contact instead of tying down numerous suppliers. Give us a call on 07711349727 to discuss your wedding plans and marquee hire requirements in more detail, or complete an online quote request and we’ll be in touch shortly. Three different options are available for the provision of electricity, depending on the size and location of your marquee. 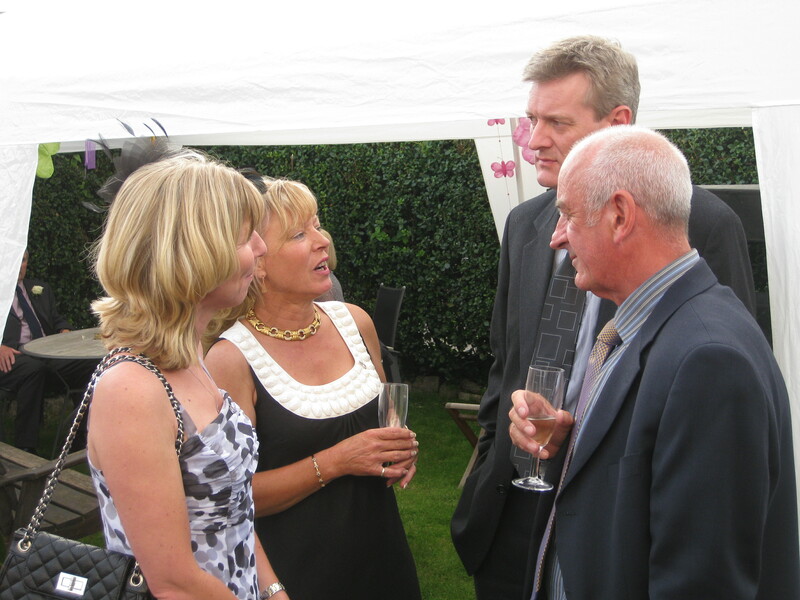 Once we have assessed your requirements we can advise you on the best option for your event. All accessories will be included in the quote we give you. 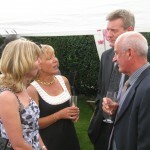 For larger events we can arrange for an electrician to visit your venue. For a smaller events (and providing your marquee is sited near a house); it is possible to run power straight from a house to 13 Amp sockets via extension cables. It may be necessary to run more than one extension cable when using this method. Please note, it is not always suitable for a catering contractor to use a house 13 Amp system so it is best to check with your caterer first what their electricity requirements will be. 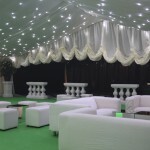 For larger events we can arrange for an electrician to visit your venue and connect the marquee electricity supply directly to a main fuse box. This allows us to run a much larger amount of power into your marquee which is then passed through a distribution box to the areas where it is needed. 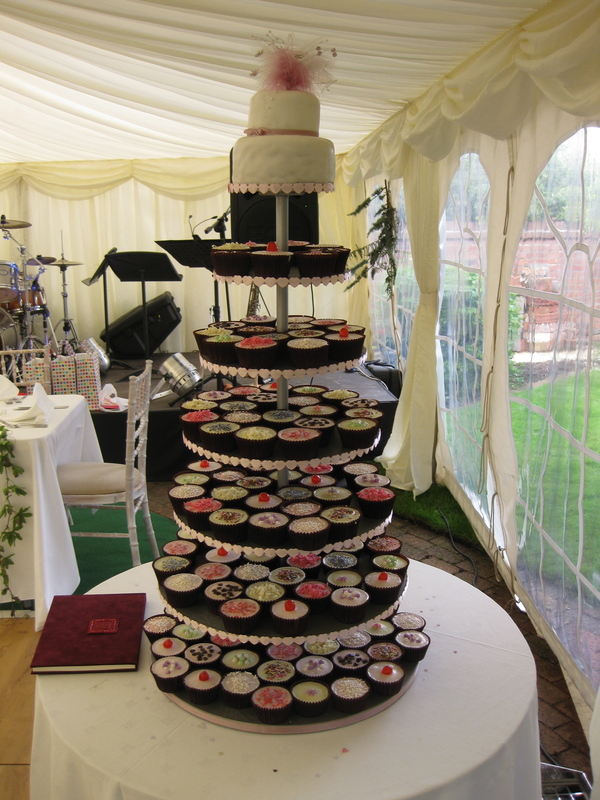 Caterers can normally (within reason) be supplied using this method. If the nearest power source is too far away from your marquee, a generator will be required. We will source and arrange delivery of a generator for you. We do not charge for this service, we simply pass the suppliers cost to you. This gives you one less thing to worry about. Peninsula Marquees modern flooring systems provide a robust, smooth and stylish ground covering that not only looks great but also protects you and your guests from muddy or exposed ground. We use hard-wearing, synthetic, woven matting which is laid on an impermeable membrane and looks both stylish and elegant. It is secured to the ground with pegs in order to provide a safe walking surface and is an excellent value for money option. 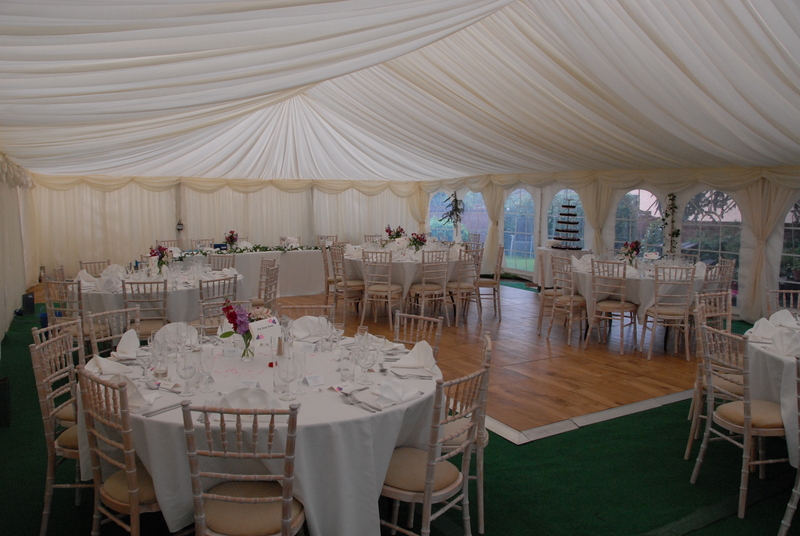 A solid wooden floor adds that bespoke effect to your marquee. Included in the price is a charcoal carpet. Should you wish for a colour of your choice this is also possible. If the venue is on a slope we have a steel frame sub base that your marquee can be built on, with the interior being perfectly level. Peninsula Marquees offers a wide range of additional floor coverings that can be placed on top of your chosen wooden flooring or matting. Simply ask us for details and samples. 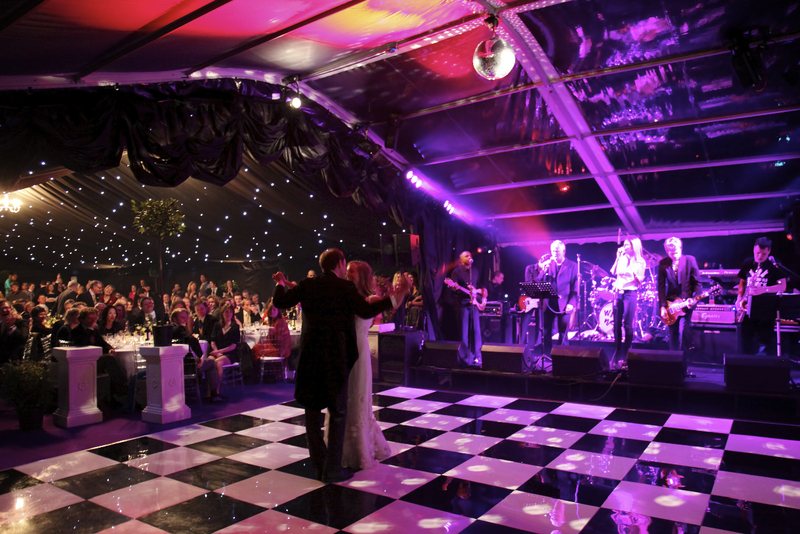 We provide dance floors which are modular and can be tailored to suit your particular needs. Available in either high gloss black or high gloss black and white. Our furniture is of a high quality and we stock a large range of different size tables. 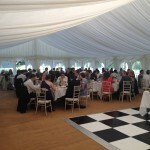 We normally recommend 5 ft 6 in circular tables as these allow the best balance across the marquee. You don’t want your guests to be cramped and unable to move around easily, similarly you do not want the tables to be so far apart that conversation cannot take place between them. Our “Chiavari” chairs look beautiful in their own right and don’t require any covers to make them look presentable. They come complete with a seat pad. 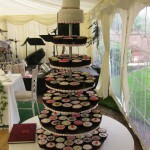 Trestle tables for the top table and caterers are not a problem and we do have 3 ft cake tables available. Should you require something different we will help source it and order it for you. 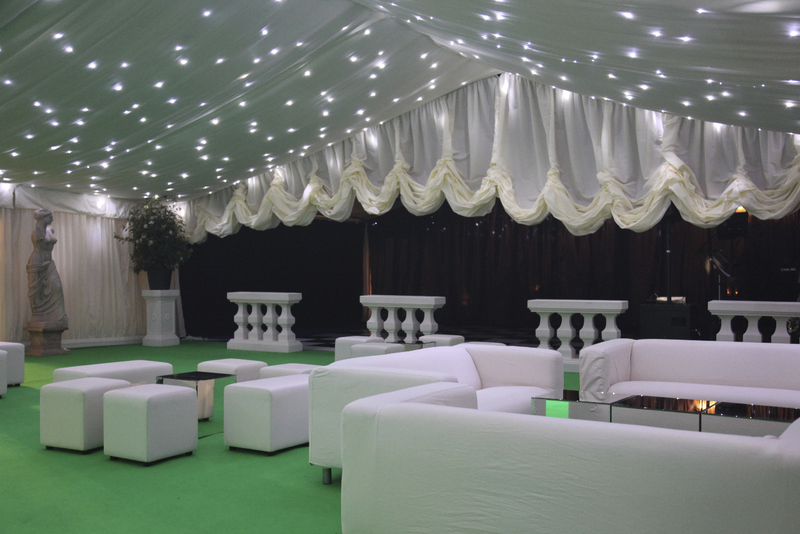 To maintain a comfortable temperature inside your marquee we advise using marquee heaters. These can be used to provide warmth during colder periods or for chilly summer evenings. Peninsula Marquees supply affordable, thermostatically controlled marquee heaters which are compact and fuel efficient. Marquee heaters are supplied complete with ducting or purpose-built diffusers which locate into the marquee side-wall and are virtually silent. The heaters can blow out hot or cold air as necessary. 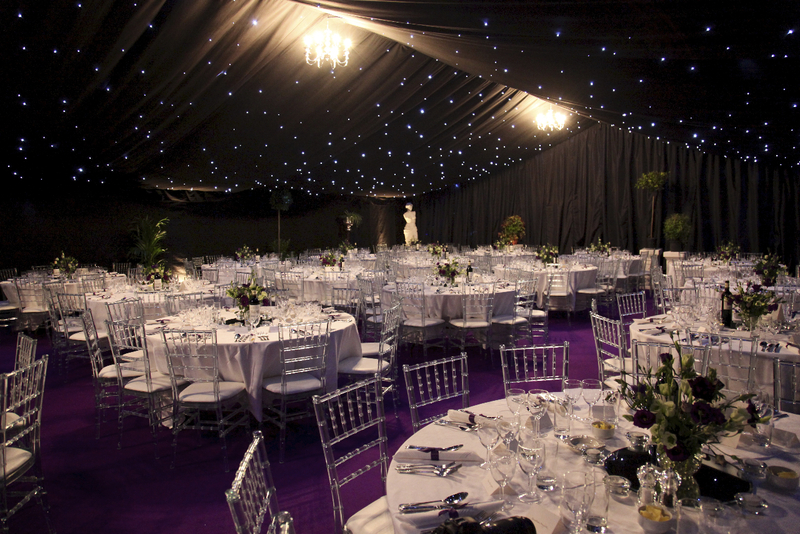 Effective lighting of your marquee can provide stunning effects that will thrill and surprise your guests. The ambience and mood can be altered by adjusting the lighting levels and colour of light as the evening progresses. For the majority of our wedding marquees we use uplighters which are placed along the walls of the marquee at even intervals providing a stylish, soft, swathe of light across the linings which can be further enhanced by the addition of a wide variety of coloured light options. For a high quality, classic look and feel we can provide chandeliers which would not look out place in a 5-Star hotel. We can provide “LED Fairy Lighting” and can set it up in any way that you feel will enhance the inside or outside of your marquee. 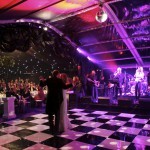 Should you want black “starcloth” ceiling lighting we will hire it in for you at no extra charge. In addition, catering and bar areas can be lit using strip-lights and LEDs respectively in order to allow safe use by all concerned. 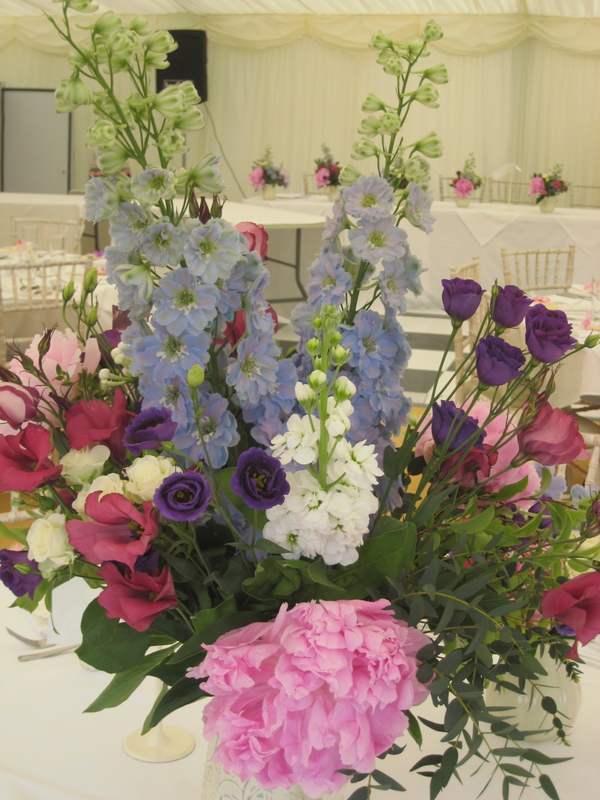 The interior of a marquee is one of the most important elements in enhancing the ‘feel’ of any event. If you don’t want to have the exposed roof beams our lining solution is the ideal option for you. 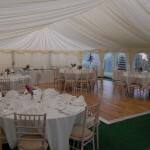 Our marquee lining is pleated ivory of a very high quality providing a simple yet elegant finish to your marquee. The neutrality of the colour will allow prominence of your chosen colour scheme, we can obtain various different colour linings and swags if required. Although toilets are not something we supply directly, we can assist you in finding and ordering the correct sort of toilet for you event. They are self contained and provide everything you would hope to find in a luxury hotel! 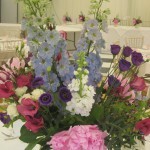 To make it easier for you, delivery and placement is organised by ourselves and delivered straight to the event for you. 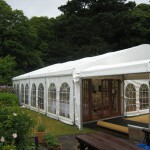 If you are looking for a quality, affordable marquee for your big day, trust Peninsula. To see our competitive pricing use the online estimate calculator.